Step 1 In a food processor, crush up the plantain chips until they’re the consistency of fine bread crumbs. Place the crumbs in a zip-top bag and add some salt, if the chips haven’t already been a-salted, I mean, salted. Corny? Yes. Step 2 Slice the fish fillets into strips/planks/sticks, widthwise. Working in batches, add a few fish strips to the zip-top bag and shake around until the strips are completely coated. Step 3 Melt your F.O.C. in a saute pan over medium heat. Place the coated strips in the pan and let them get brown before you flip them to the other side. This should take less than a minute for each side. If you’ve cut the fish sticks pretty thick, don’t forget you’ve got 4 sides to brown, not just 2. 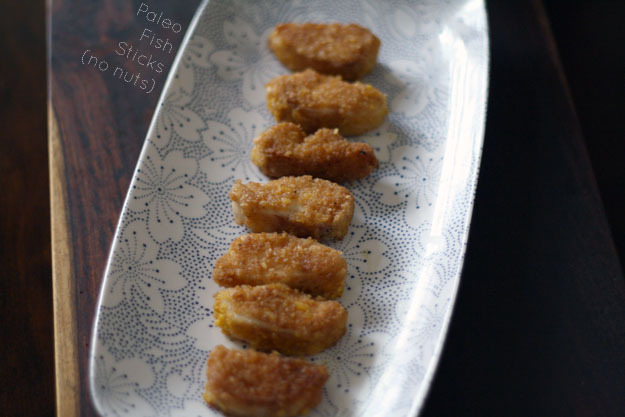 Perfectly crispy and easy to make, these fish sticks may fool even the most seasoned fish stick connoisseur.